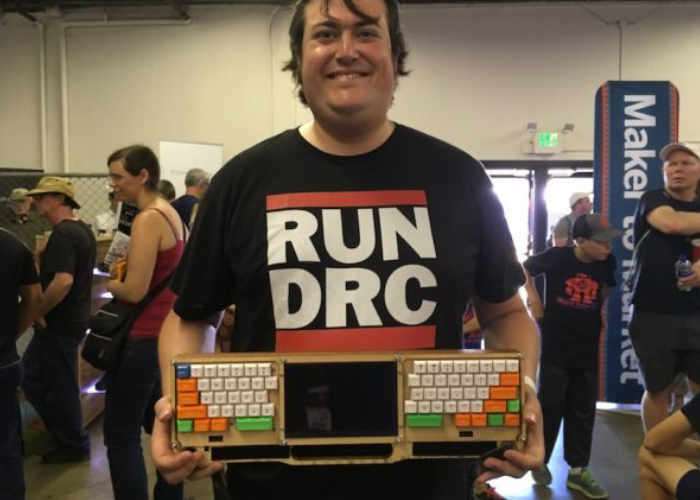 Maker Kerry Scharfglass has created a unique Raspberry Pi workstation which incorporates a split keyboard together with a 7 inch 720p resolution display in the centre, all housed in the laser cut wooden closure. The awesome portable computer system is powered by a Raspberry Pi mini PC and has been aptly named The Commute Deck and Kerry has kindly published everything you need to build your very own over on GitHub. Other features of the portable Raspberry Pi workstation includes a handy guitar strap carry system, rechargeable LiPo battery pack, two USB hubs as well as connectivity via Bluetooth and Wi-Fi. Kerry started by hand wiring the Teensy 2 controlled split mechanical keyboard switches with ribbon cable (fun! ), and embedding a Raspberry Pi 2 and 7″ 720p screen in a layered, laser cut enclosure. It’s all powered by a repurposed LiPo battery/charger system, and included two USB hubs, WiFi and Bluetooth dongles, and most importantly, a totally rad guitar strap carry system.